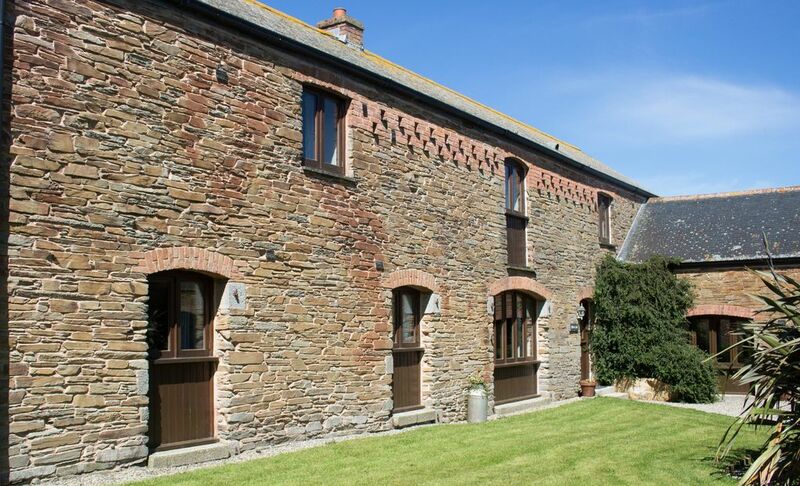 The Roundhouse is one of our three barns nestling around a courtyard situated on our family run beef farm. There are 4 bedrooms and can sleep up to 8 people. On the ground floor there is a twin bedded room with a bathroom next door. The other ground floor bedroom has a king size bed with en-suite shower room. The first floor has a bedroom with king size bed and en-suite shower room. The other bedroom has either twin beds or zipped and linked to make a 6 foot bed with en-suite shower room. The fully equipped kitchen has a dishwasher, 2 fridges and deep freeze. There is a laundry room with washing machine and separate tumble dryer. The spacious lounge/diner has an open vaulted ceiling with open wood beams, comfy sofas, large dining table and French Doors that lead onto your patio area with a shared 2 acre garden and outside play equipment. There is oil fired central heating throughout with a log burner in the lounge/dining room. Mike and Alison Roberts have been welcoming guests for more than 14 years as well as running the family working beef farm. There are 3 en-suite shower rooms and 1 bathroom. Plenty of space for 5 adults and 3 children. Great garden area.Nothing to complain about.